Firefighters are often provided with an oversimplified explanation of fundamental scientific concepts related to fire behavior. This is done with the intent to make training manuals and texts understandable and to focus on the information that firefighters �must know�. However, a tremendous opportunity to develop the ability to make sense of fire dynamics and the impact of tactical operations is lost in the process. This series of posts continues to explore ways of building a scaffold to allow firefighters to develop a deeper understanding of firefighting as science. The term radiation is used to describe many different things ranging from visible light, infrared light, and ionizing radiation such as x or gamma rays. Each of these is an example of radiation as an electromagnetic wave produced by the motion of electrically charged particles. Electromagnetic radiation can travel through empty space and air. Radiation can also penetrate through other materials depending on the characteristics of the material and the radiation�s energy. Some ionizing radiation is in the form of particles (rather than waves), but that is outside the scope of our examination of radiation as a mechanism of heat transfer. 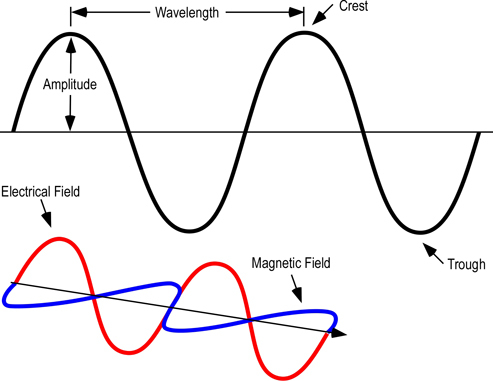 As illustrated in Figure 1, electromagnetic waves can be described in terms of their wavelength, amplitude, frequency, and energy. Thermal radiation is electromagnetic radiation emitted from the surface of an object which is due to the object’s temperature. Any material that is above absolute zero gives off some radiant energy. Thermal radiation is generated when heat from the movement of charged particles within atoms is converted to electromagnetic radiation. Thermal radiation occurs at a wide range of frequencies. 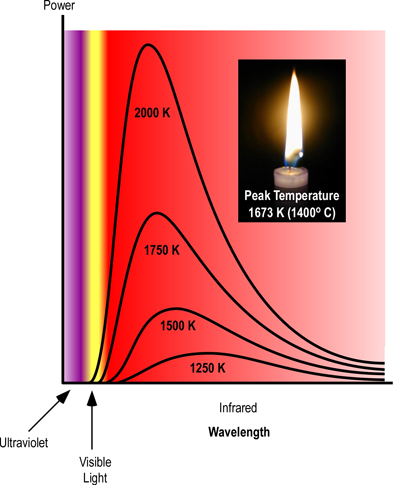 However, as illustrated in Figure 2, the power emitted at each wavelength is dependent on temperature, with the main frequency and power of emitted radiation increasing as temperature increases. This can be observed when color changes from red, to yellow, and then white as an object is heated. 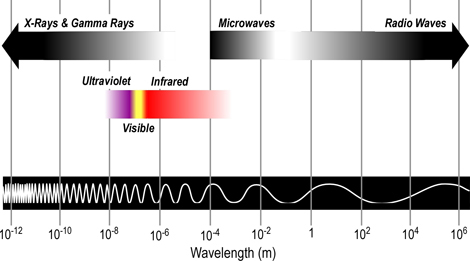 While color change is visible, most of the radiant energy is still in the infrared spectrum. Electromagnetic waves of any frequency will heat surfaces that absorb them. However, temperatures of hot surfaces, gases, and flames in the fire environment result in emission of electromagnetic waves predominantly in the infrared and visible portion of the spectrum. Stefan-Boltzmann Law: The amount of energy per square meter per second that is emitted by a black body is related to the fourth power of its Kelvin temperature. As temperature increases, emission of radiant energy increases exponentially. A black body is a theoretical object that completely absorbs all incoming radiant energy and is also a perfect emitter of radiant energy. Materials encountered in the fire environment do not completely have the characteristics of a black body and may be classified as gray bodies. A gray body absorbs or emits a portion of the radiative flux depending on the emissivity (?). Emissivity is the relative ability of the surface of a material to emit radiant energy. It is the ratio of energy radiated by a particular material to energy radiated by a black body at the same temperature. 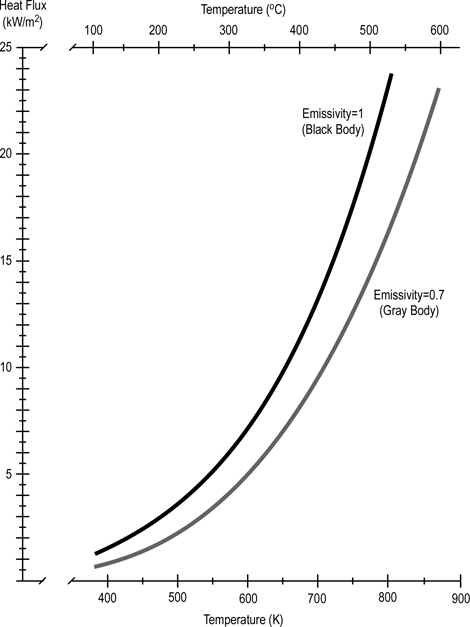 Emmisivity of a black body would be 1.0 with the emissivity of actual materials ranging from approximately 0.1 for highly reflective materials (e.g., polished silver) to 0.97 for fairly efficient absorbers and emitters of radiant energy (e.g., carbon particulate). Emission of radiant energy is measured as heat flux (energy transfer per unit of time over a given surface area). The SI unit of measure is joules/second/square meter or (since a watt is a J/s) watts/square meter (w/m2). Electromagnetic radiation spreads out as it moves away from its source. As a result, the intensity of the radiation decreases as distance from the source becomes greater (as illustrated in Figure 5). The simplest example involves a point source of radiation (distance from the source is much greater than the size (e.g. surface area) of the emitter). With a point source, reduction in radiation intensity follows the inverse square law. Inverse Square Law: For point sources, intensity of the radiation varies inversely with the square of the distance from the source. Doubling the distance reduces intensity of the radiation by a factor of four (1/4 of its original value). When radiation is emitted from other than a point source (as it is under fire conditions), variation of the radiation intensity with distance is more complex. If the area of the source is large compared with the distances involved, intensity decreases with distance but does not follow a simple law. 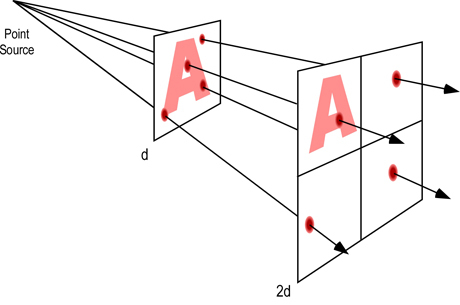 As a rough guide, if the distance from the source is greater than about 5 times the dimensions of the source, the inverse square law can be applied. Subsequent posts in this series will examine physical and chemical changes and the process of combustion. 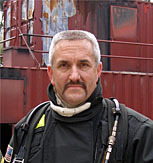 Methods of heat transfer are often presented to firefighters in a simplistic way with the expectation that they will understand the basic concepts and are assessed on their ability to recall the definitions of conduction, convection, and radiation. Unfortunately this does not provide a solid basis for understanding phenomena encountered on the fireground. In general terms, convection refers to movement of molecules within fluids (i.e., liquids and gases). 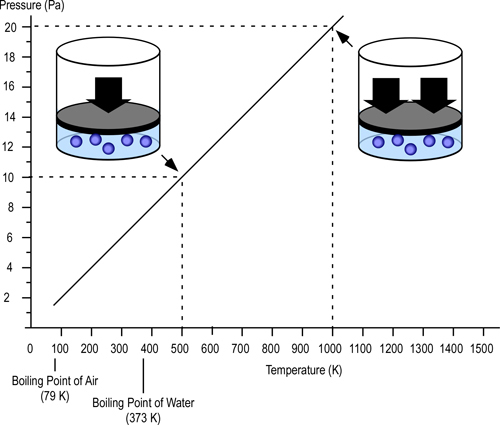 Convection results in both heat and mass transfer (these are interrelated as extensive properties such as thermal energy are dependent on mass). Convection involves diffusion due to random movement of individual molecules (Brownian motion) and large scale motion of currents in the fluid (advection). Natural or free convection results from temperature differences within a fluid. As a fluid is heated, it expands while mass remains the same. 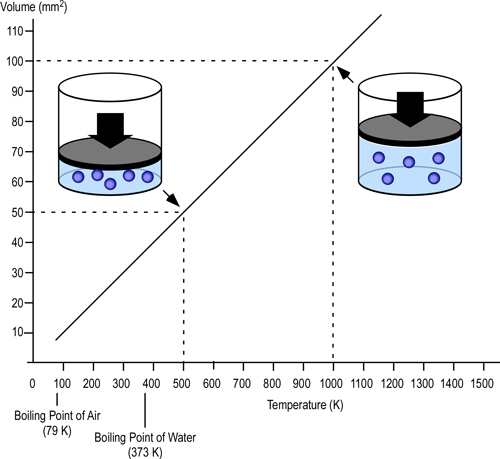 Decreased density (mass/unit volume) makes the heated fluid more buoyant, causing it to rise. As the heated fluid rises, cooler fluid flows in to replace it. Natural convection is one of the major mechanisms of heat transfer in a compartment fire, heated air and smoke rise and cooler air moves in to replace it. This process transfers thermal energy, heating other materials in the compartment and also transfers mass as smoke moves out of the compartment and cool air (containing oxygen necessary for continued combustion) moves into the compartment. In the late 1700s, French scientist Jacques Charles studied the effect of temperature on a sample of gas at a constant pressure. Charles, found that as the gas was heated, the volume increased. As the gas was cooled, the volume decreased. This finding gave rise to Charles Law. Charles’ Law: At a constant pressure, the volume occupied by a fixed mass of gas is directly proportional to its thermodynamic temperature (V?T). Density is mass per unit volume (?=m/V). As the volume of a given mass of gas increases, it becomes less dense (and more buoyant). If unconfined, gases that are less dense than the surrounding air will rise (resulting in natural convection currents). In a compartment fire, conditions are not as simple as stated in Charles Law. Initially, hot gases resulting from a fire in a compartment are relatively unconfined as the volume of smoke and hot gases is small in relation to the size of the compartment and there may be some leakage of smoke from the enclosure. However, as the fire continues to develop, the volume of smoke increases and conditions change. Gay-Lussac�s Law: At a constant volume and mass, the pressure exerted by a gas is directly proportional to its thermodynamic temperature (P?T). The pascal (Pa) is the standard international unit of measure for pressure (force per unit area) and is defined as one newton per square meter (N/m2). To provide a point of reference for firefighters more familiar with pounds per square inch (psi) as a unit of measure for pressure, 1 Pa = 0.000145 psi. Low pressures (such as the pressure generated by temperature increases in a compartment fire) are measured in Pa while higher pressures (such as fire pump discharge pressure) are more commonly measured in kilopascals (kPa=1000 Pa). As illustrated in Figure 2, if the volume is constant (e.g., the gas is confined) doubling the temperature in Kelvins, doubles the pressure in pascals (Pa). When a fire is unconfined (e.g., outdoors), convection is influenced primarily by differences in density between hot fire gases and cooler air. Convection as a result of a fire in an enclosure (e.g., compartment fire) is significantly influenced by differences in density and differences in pressure. In forced convection, energy is carried passively by fluid motion which occurs independent of the heating process. While at first glance, it may appear that this type of convection would not be encountered in the fire environment, but it is extremely important. 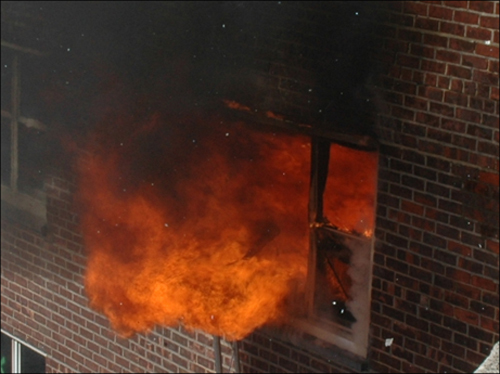 Forced convection can be caused by natural effects such as wind blowing into an opening (e.g., window broken due to fire effects). This type of forced convection can quickly create untenable conditions both inside the compartment and in adjacent spaces (e.g., rooms, hallways). Forced convection can also have a positive influence on the fire environment. One example would be the use of positive pressure ventilation, in which a blower (fan) is used to create an air flow from an inlet to an exhaust opening, removing hot smoke and gases from the compartment. Note: Adapted from Fire Fighting Tactics Under Wind Driven Fire Conditions: 7-Story Building Experiments. Heat transfer by convection is more complex than conduction as there is no single property such as thermal conductivity that can be used to describe the mechanism of heat transfer. Factors that influence heat transfer by convection in the fire environment include temperature difference between the fluid (gas) and surfaces, fluid velocity, and turbulence (related to surface roughness and compartment configuration). Figure 5 illustrates convective heat transfer with laminar (smooth) fluid flow. Energy is transferred from higher temperature fluid molecules to the cooler surface. Bulk fluid temperature (Tb) is the temperature of the fluid some distance away from the surface. As heat is transferred, the temperature of the fluid molecules is lowered (with a corresponding rise in surface temperature). These cooler molecules insulate the surface from the higher temperature molecules further away from the surface, slowing convective heat transfer. When velocity and/or turbulence increases, cooler molecules that have transferred energy to the surface are quickly replaced by higher temperature molecules, resulting in increased convective heat transfer as illustrated in Figure 6. This is the same phenomena as wind chill, except in this case, energy is transferred from a hot fluid (gas) to a solid surface rather than from a hot surface (i.e., your skin) to a cooler fluid (air). Subsequent posts in this series will examine radiant heat transfer and then move on into discussion of the process of combustion. Kerber, S. & Madrzykowski, D. (2009) Fire Fighting Tactics Under Wind Driven Fire Conditions: 7-Story Building Experiments, NIST Technical Note 1629. Gaithersburg, MD: National Institute of Standards and Technology.